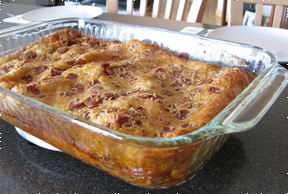 Pizza flavored casserole that is perfect for any weeknight. 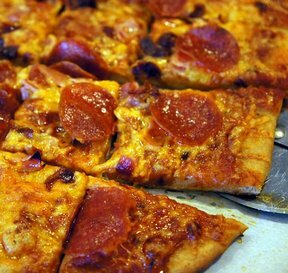 Kids will love the "upside-down" effect of their favorite Friday night pizza. Brown beef, onions and peppers and mix in other ingredients. Line 9x13 pan with pepperoni slices. Pour meat mixture on top. 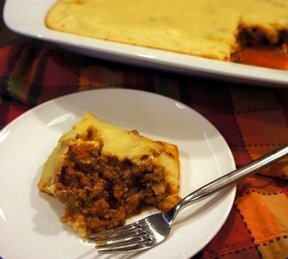 For Topping: Mix and pour on top of meat, sauce and cheese mixture and bake for 20 minutes. 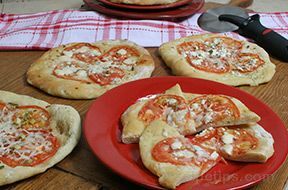 Other pizza ingredients may be added to above mixture. *Note the topping does not become a golden brown like you would expect when it is ready. "There were 5 of us and we ate almost the whole dish so it was a BIG hit. I used spaghetti sauce instead of pizza sauce since that's all I had. I will make this again."